Discover the hidden taste of the old town of Malamocco with the Locandiere, Michela e Micaela. 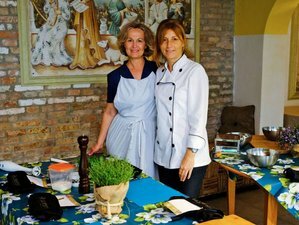 Learn more about the local cuisine and experience the joy of picking your own ingredients and cooking in the historic kitchen of the luxury villa in Relais Alberti. You will have plenty of time to relax in the blooming gardens and take a break from the crowded Venice while sipping aromatic water or a tasty glass of wine. Relais Alberti is much more than a hotel; it is first and foremost an experiential journey where every moment becomes an opportunity to see, smell, taste, touch, and live. Alberti is a place to rediscover the smells and scents of forgotten flavors and sensations, away from the routine of the city. It's a place to get together and to rediscover the simple pleasures of life. Relais Alberti is furnished with ancient Venetian furniture, Murano glass chandeliers, precious carpets and fabrics, and marvelous stuccos and Fortuny textiles. There, you can really get the feeling of the past. All rooms at Alberti are equipped with every comfort that includes room service, TV, air-conditioning, bathrobe, Wi-Fi, and telephone. Collect ingredients in the garden or local market or mussels factory for a bespoke lesson with Michela. She asks what food you love and together you prepare the lesson. You could also have vegetarian and gluten free recipes. Your hosts love to bring their guests to explore the island, to collect the items needed for the recipes; a funny day to understand better the lovely land. I've been working for many years now in the little hotel of my family, where as a child I started falling in love with cuisine, with hosting and with conviviality. Eventually I have been lucky enough to be able to make of cuisine my full time passion, passing down to our guests the recipes of our land and of our lagoon, so that they will always keep, in their hearts and on their tables, a fragment, as tiny as it is splendid, of my beloved Venice. Malamocco is one of the oldest settlements in the Venice lagoon. Its history goes back to the times of the ancient Romans. The Borgo is a place full of mysteries and legends; the old sea men of the lagoon narrate how the ancient Metamauco village once stood facing the sea and after was swept away by a violent seaquake. The inhabitants say that in the days of calm sea, it is still possible to see the ruins of the ancient city. Today Malamocco, or Novo Metamauco, is a stunning ancient village in the intimacy of the Venetian lagoon where time seems to be suspended in a dream state of calmness. Despite its proximity to the city center of Venice, there is an air of quietness and serenity, privacy and self-dialogue. Like a hug coming from the sea, Relais Alberti is located right in the heart of the Borgo, ready to welcome its guests as Le Locandiere used to do with the veterans returning from a faraway sea or land journey. Your voyage to your emotional maison to rediscover lost sensations. At the Relais Alberti, food is 100% organic and handmade and comes daily from the bio orchard, starting from the breakfast, Alberti’s specialty, to the finger food and special recipes they offer their guests during the day. Ancient tradition has it that Le Locandiere are always feminine figures, able to manage with passion and energy the wayfarer’s resting and nourishing areas. A smile is the key to their success. Le Locandiere are the true masters of hospitality and good food lovers. They stand upon the solid foundations of the Venetian tradition while looking at the future: this is the newborn concept of Le Locandiere. You can row a boat or do bio walking with personal trainer. Please ask your hosts for details. Please book your flight to arrive at Venice Marco Polo Airport (VCE). Alberti is much more than a tourist hotel. It is an experiential journey where every moment becomes an opportunity to see, smell, taste, touch, and live. This vacation can accommodate solo travellers.